Do you have a battery that is swollen, corroded, leaking or showing burn marks? Or one that has been recalled by the manufacturer? As batteries power more and more of the devices we use, these types of incidents are becoming more common. Damaged lithium metal or lithium-ion batteries are considered especially hazardous. 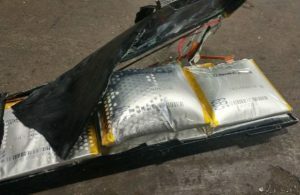 If these batteries are shipped without proper protection, they are more likely to cause safety incidents, such as sparks, which can lead to a fire. Damaged, defective or recalled (DDR) batteries therefore cannot be placed in a regular Call2Recycle box or a normal container. They also cannot be transported via air. Transportation Canada requires a special handling and shipping process. Call2Recycle offers a recycling service that meets all of Transportation Canada’s packaging, handling and transportation requirements. The service provides the appropriate solution based on the battery type and applicable shipping requirements. In addition to accepting damaged batteries, we provide services for defective and recalled batteries that the manufacturer or Consumer Product Safety have identified as having a performance or safety issue that requires the battery to be specially transported. If you think you have a damaged, defective or recalled (DDR) battery, contact Call2Recycle Customer Service, who will discuss the appropriate solution with you. You can read more about our battery recycling services below. Consumers: Place the DDR battery in a non-flammable material, such as sand or kitty litter, as soon as possible. Check Health Canada’s Consumer Product Safety information, the manufacturer’s web site, or visit the retailer you purchased it from to see if the battery has been recalled. If it has, follow the instructions provided by the manufacturer, retailer or Health Canada. Alternatively, place the battery (one per bag) in a clear plastic bag and take it to your municipal household hazardous waste (HHW) recycling centre. You can also contact a local Call2Recycle drop-off site to see if it accepts damaged batteries. Do not place them in the garbage for any reason. Municipalities: Do not place DDR batteries in your regular Call2Recycle collection container (box or drum). Follow the internal procedures for handling household hazardous waste (HHW). If a HHW service is unavailable, contact Call2Recycle Customer Service to discuss our battery recycling service. Place the battery in a non-flammable substance such as sand or kitty litter in the short term. Retailers: Do not place DDR batteries in your regular Call2Recycle collection box because they could cause a safety incident, such as a spark or fire. Instead, follow your company’s procedures for handling household hazardous waste (HHW). If you do not have an internal HHW program, call Call2Recycle Customer Service to discuss our battery recycling service. Place the battery in a non-flammable substance such as sand or kitty litter in the short term, if needed. Manufacturers with defective, damaged or recalled batteries: Contact Customer Service to discuss the Call2Recycle recycling service, which provides the special packaging and recycling services required by Transportation Canada for these types of batteries. To learn more about safe battery recycling, visit our other safety resources, including our shipping guidelines.